Premier League is since the 1992-1993 season the top tier of the English football league system (before that Division One had the same function). The next three tiers are incorporated in the so-called English Football League (EFL). When two additional tiers follow, which are part of the National League. An overview of the current league system in England is presented in the table below. Below National League North and National League South follows several other tiers divided by regions. Statistics of all English clubs that have won the Premier League, concerning the period 1993-2018. This is only based on the seasons since the league changed name. If all seasons going back to the year 1888 would be included the list would look different. Manchester United would still be on top, though, with 20 titles, but Liverpool would come as the second best with 18 titles. All winners since first season including collected points per season by the winner. Since the league consists of 20 teams (except the three first seasons in which 22 teams were included), which meat each other two times (home and away) per season, 380 games are played in total. Most points by a team in a season, 100 (2.6 per match), was collected by Manchester City in season 2017-18. Alan Shearer holds the record in the Premier League by 440 goals from the years in Newcastle. Other notable top scorers are Andy Cole (187 goals), Wayne Rooney (187 goals), Frank Lampard (177 goals), Thierry Henry (175 goals), Robbie Fowler (163 goals) and Michael Owen (150 goals). Extra impressive is Henry with most goals per match: 0,68. Soon after the start of Premier League, the terraces for standing were forbidden and instead the whole audience was to sit down to watch the games. The table shows the capacity of all Premier League club stadiums (based on the teams that participated in the league season 2016–2017). Manchester United's Old Trafford is the biggest in the league with capacity for over 70,000 people. To put the capacity in relation to the actual audience per match we could take Manchester United as an example. During the 2015/2016 season the average attendance was 75,279. The tickets are mostly sold in season package, but for comparison, a match-day ticket in season 2015/2016 would cost from £22 (Leicester) to £52 (Chelsea). The matches in Premier League are well sought after and the big stadium is regularly full or almost at the competition. 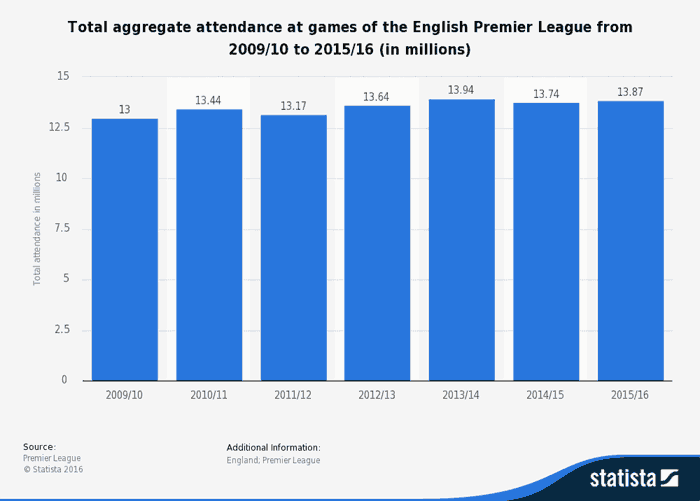 The diagram below shows aggregate attendance at games over the last seven seasons. Premier League is a league with lots of money involved. The television contracts are extremely expensive and result in big revenues for the association and the clubs. The gap of revenues is huge between Premier League and the Football League Championship. Also, in the top league there are differences. The broadcast payments are divided into three parts: 1) Equal share payments – the biggest part which all teams get in the same size; 2) Facility fees – payment for a club being featured in a live match; 3) Merit payments – based on performance. The kit sponsorship revenues from the Premier Legues is enormous and expected to be over €100 million per year. 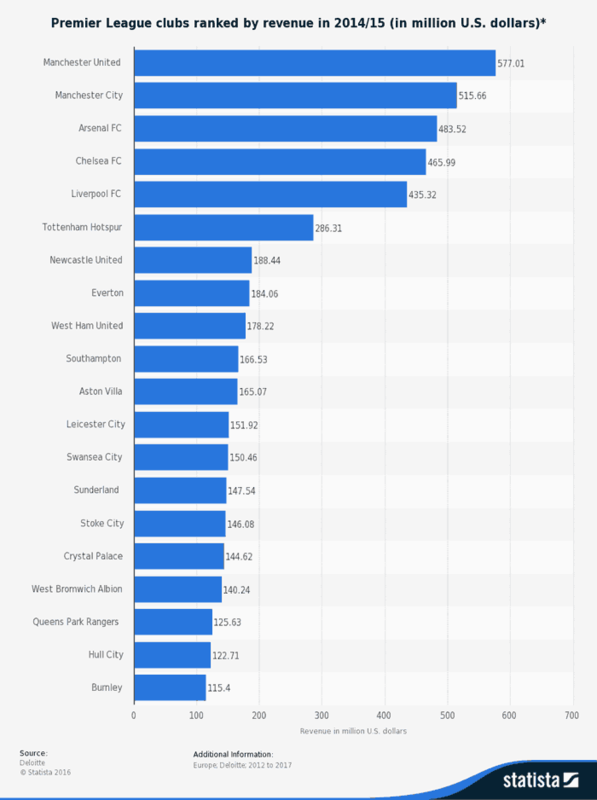 The diagram below shows the total revenues of the Premier League clubs in 2014/2015 (in million pounds). Millions of pounds are involved in buying and selling players. 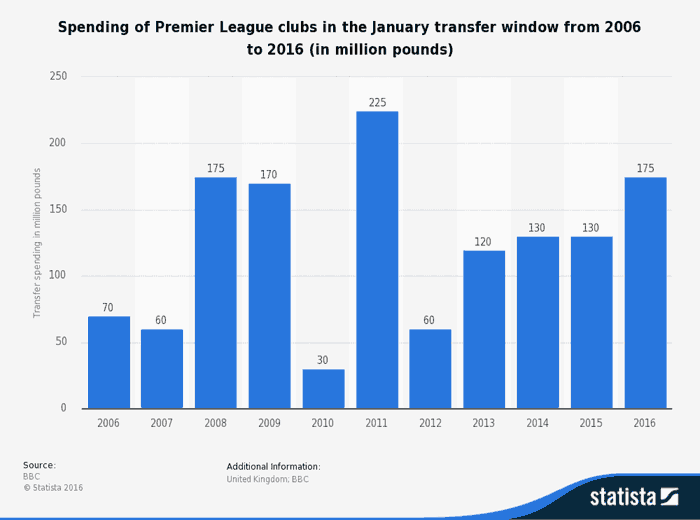 The diagram below shows the total spending of Premier League clubs in the January transfer window from 2006 to 2016 (in million pounds). The Premier League has four places in the Champions League and one place in Europa League (winners of the FA Cup and the Capital One Cup also qualify for the Europa League). The three teams placed at the bottom of the table (places 18-20) will be relegated to EFl Championship.